We interrupt the series of chronological book summaries to discuss an important part of Charles Williams’ life at this time. So far, I have posted summaries of his books up to 1917–one of the most important years in his life. In that year, Williams got married, and joined the Fellowship of the Rosy Cross. This little series of three posts discusses that occult secret society and Williams’ association with it. Note: This may be the area of Williams scholarship in which I have the least expertise, so I welcome comments from those who are more knowledgeable about this subject. Please submit comments, questions, corrections, and suggestions. Thank you. 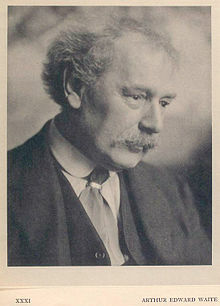 Arthur Edward Waite (1857 – 1942) was a poet-scholar who dedicated his life to acquiring the liturgies of many secret societies. He probably joined more secret societies than anyone else before or since: on the 4th of March, 1903, he wrote in his diary: “If my receptions go on at this rate, I look shortly to be the most initiated man in Europe.” In 1902 alone he joined at least nine different secret societies: the Holy Royal Arch, the Knights Templar, the Knights of Malta, the Swedenborgian Rite, the Mark Degree, the Red Cross of Constantine, the Secret Monitor, the Ancient and Accepted Rite, and the Early Grand Scottish Rite. His goal was to discover and/or to reconstruct a “Secret Tradition” that he believed was a deeper form of Christianity than that practiced in churches or taught in the Bible. This secret tradition, he thought, had been passed down verbally from one keeper of secrets to another, and had become dispersed among various occult/hermetic traditions, texts, and practices. It would provide a higher enlightenment, a true knowledge, a kind of Gnostic (but embodied) path to “real” spirituality. It appears that Waite thought he could master this “secret tradition” by learning all the words of all the secret societies. I find this fascinating: that secret spiritual knowledge and power should reside in the combination of just the right words. So he kept collecting the “Rites”—that is, the liturgies, the ceremonial words—of all the societies he joined: Masonic, Rosicrucian, Golden Dawn…. His idea was to sift through these, then write his own ritual, which would be The One Rite that would express, contain, embody, or reveal that Secret Tradition. As he went along, he also climbed up the power structures of the Orders, especially the Golden Dawn. Although it was not the Golden Dawn that Williams joined, it is an important enough precursor of the Fellowship of the Rosy Cross that it deserves some explanation here. The Hermetic Order of the Golden Dawn was, or is, a magical secret society of the 19th and 20th centuries, practicing theurgy or “white magic,” along with principles of spiritual enlightenment, combining elements from many traditions into a syncretistic ritual. It was probably the single greatest influence on twentieth century western occultism. It was founded in London in 1888 by Dr. William Wynn Westcott and Samuel Liddell MacGregor Mathers. It absorbed much of the Rosicrucian, or Rosy Cross, tradition. There are varying stories of its ultimate origins of the Rosicrucian tradition. Here are the two most common. First, the Order traces its beginnings to one Christian Rosenkreuz, who may or may not have been an actual 15th century personage. Several texts attributed to him are extant, which are claimed as the founding documents of the Order. Second, a more general legendary tradition is based on the supposed writings of Hermes Trismegistus, who may have been an Egyptian, Greek, or Roman deity. This tradition’s rituals and documents were incorporated into the 19th-century Order of the Golden Dawn, along with a variety of other occult practices. It was certainly a high, lofty Order that involved beautiful, complex rituals: the wearing of vestments, the speaking of high-sounding words, genuflection, choreography, memorization, meditation, and the like. They engaged in many practices that have traditionally been shunned by Christians, but which claim a long secret partnership with Christianity. There were many famous members of one or another branch of the Golden Dawn throughout its later 19th-century and early 20th-century days, including Aleister Crowley, W.B. Yeats, Algeron Blackwood, Arthur Machen, and Evelyn Underhill. Around the turn of the Twentieth century, the Order of the Golden Dawn went through a power struggle. This partly had to do with personality clashes, with power plays, and with corruption at the highest levels. But there is also some indication that the Golden Dawn was torn over Waite’s emphasis on mysticism vs. Aleister Crowley’s and Yeats’s and others’ insistence on practical magic. R. A. Gilbert, Waite’s biographer, wrote that “The two offshoots—the one magical and the other mystical—of the old Golden Dawn continued in uneasy harmony for three years.” These differences eventually led to a split. After leaving the Order of the Golden Dawn as a result of this split, Waite founded his own order. On the 9th of July, 1915, Waite “consecrated the Salvator Mundi Temple of the Fellowship of the Rosy Cross.” Waite’s Order was supposed to be Christian and mystical, rather than pagan and magical, and it combined elements from Masonic, kabbalistic, alchemical, and Tarotic tradition in its rituals. It was Waite’s Rosicrucian society that Williams joined in 1917. How could Williams, a devout Anglican Christian, be a member of this quasi-occult organization? Well, tune in to my next post for a summary and analysis of Williams’s involvement in the F.R.C.! This entry was posted in Rosicruciana and tagged A. E. Waite, Rosicruciana, Rosy Cross. Bookmark the permalink. I hope that, in the course of these Waite/F.R.C. posts, you will give us your suggestions for futher reading! Yes; My third post in this series is planned to be a reading list. To anticipate your recommendations, I know Ed Gauntlett, editor of the Charles Williams Society Quarterly, wrote a thesis on C.W. and the F.R.C. (I think it was once even posted at the Society site, but I may be muddled, here). At the risk of getting ahead of your telling of the story, I see that three different copies of The Oxford Book of English Mystical Verse “Chosen by D.H.S. Nicholson and A.H.E. Lee” have been scanned at the Internet Archive (apparently two 1917 first editions as well as a 1962 eleventh reprint). R.A. Gilbert, in The Golden Dawn: Twilight of the Magicians (1983), tells that Lee (a clergyman of the Church of England) had been a member of the Isis-Urania Temple of the Golden Dawn and friend of Waite,;later became Imperator of the Amoun Temple set up to compete with the Isis-Urania after Waite took that over in 1903, while remaining friends with Waite; and later still joined Waite’s Salvator Mundi Temple of the Fellowship of the Rosy Cross, of which Nicholson was also a member. He tells further (p. 76) that their work on the Book of English Mystical Verse brought them into contact with Williams and that it was Lee who sent Williams on to Waite, with C.W. first visiting Waite at his home on 4 September 1915. Nicholson and Lee would remain two of Williams’s closest friends for the rest of their lives (which was more than 15 years in the case of Nicholson and more than 25 years in the case of Lee). None of Lee’s other books are in the Internet Archive, but two of Nicholson’s are, including Poems (1913). In the context of your previous post, Nicholson’s “Christmas” (pp. 44-45 of Poems) may be particularly interesting, including the speaker saying, “We are the Father and we the Mother” and “Thou art born of our great desiring, / Child of Light, in our inmost part”!